A comedy-drama about a boy with severe facial deformities, who enters the fifth grade at a local school, for the first time, and attempts to fit in there. 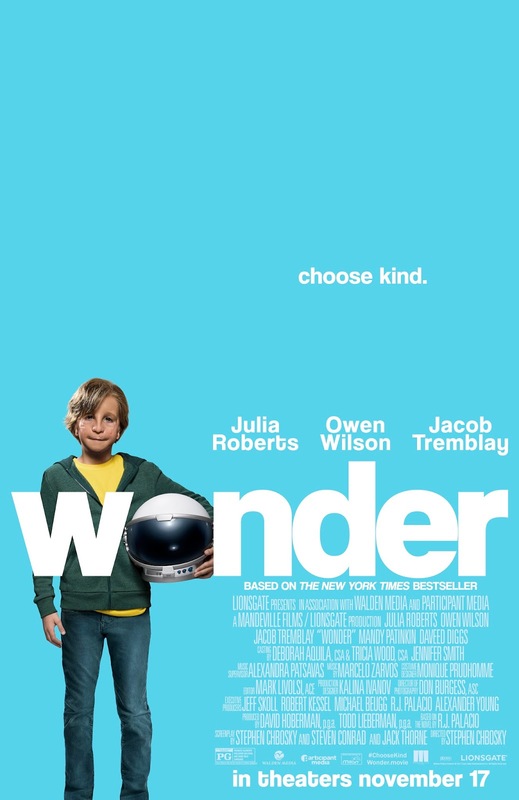 The movie stars Jacob Tremblay (who first garnered critical acclaim for 2015's 'THE ROOM'), Julia Roberts, Owen Wilson, Izabela Vidovic, Noah Jupe, Bryce Gheisar, Mandy Patinkin and Daveed Diggs. It was directed and co-written by Stephen Chbosky, who also wrote and directed 2012's outstanding 'THE PERKS OF BEING A WALLFLOWER' (which is also about a young outsider that's trying to fit in). Steve Conrad and Jack Thorne also co-wrote the screenplay, which is based on the 2012 novel, of the same name, by R.J. Palacio. The film has gotten mostly positive reviews from critics, and it's also been a big (unexpected) hit at the Box Office as well. I (for the most part) really enjoyed it, and I also think it's really well made (for the most part), but I definitely have my problems with it as well. August Pullman, also known as Auggie (Tremblay), was born with facial deformity (Treacher Collins syndrome), and he's had surgery numerous times because of it. He's never been able to fit in with others, of course, because of it as well. His mother and father (Roberts and Wilson) enroll him in a school for the first time, called Beecher Prep. Auggie is of course harassed and alienated by most of the other students there, but he's also able to make a few friends over time. The movie details how Auggie, his classmates, friends, and family are all changed by Auggie's new experiences there. The movie is extremely relatable to me, in some ways more so than any other film I've ever seen. I grew up harassed and alienated by others for looking different. I think the first half of the film does an excellent job of depicting what that's like, and how it affects all areas of someone's life (as well as those around them). My only problem with the film is the excessively happy (and extremely unrealistic) ending. I think it's really positive and inspiring to depict society in such a positive light (where everyone easily learns form their biases and prejudices, that quickly) but life just doesn't work that way. On the other hand though, I think this is still a really positive and important movie for kids to see, because they're the most likely to learn from their faults, and try to progress because of them. Where as adults are much too set in their ways, and are incredibly fearful of change (and accepting their flaws). This film does a great job of illustrating that as well (when it shows how the bully's parents are much more bigoted, and full of fear and hate, than the young bully is). In my experience adults are much worse in their 'looks prejudice' than children have ever been too, and they're much more likely to victim blame as well, like the parents in this movie do ('so called friends' also do this). So while I really loved the first half of this film, I found the second half to be kind of insulting and completely unrealistic. It is still an important movie though, that could help kids learn from their biases and prejudices, and want to be better people because of it. So for that I'll still give it a pretty good rating.